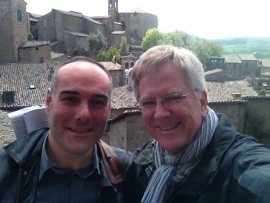 Thanks to many years of experience in the field, to our love for our areas and to David Tordi (our General Tours Manager and Tour Guide, also working for Rick Steves Europe), we provide high quality escorted and guided tours of Tuscany and central Italy. Our team, led by David Tordi, provides several tourist services for any request or need, including custom designed tours for individuals and groups, to fully experience Tuscany, its culture, food, tradition, wines, folklore, history and much more. Throughout the whole year we organize and run many guided tours in the areas of Siena, Florence, Chianti, San Gimignano, Volterra, Montalcino and many more wonderful Tuscan towns. Guided visits of Siena and Florence downtown, the Uffizi Gallery tour and much more. An ideal way to learn and be fully immersed into Tuscany!